Experience the iPhone phenomenon for yourself, without the long term carrier commitments. Have one phone and number as you travel in Europe. Now with FREE incoming calls option. Coming to the United States? 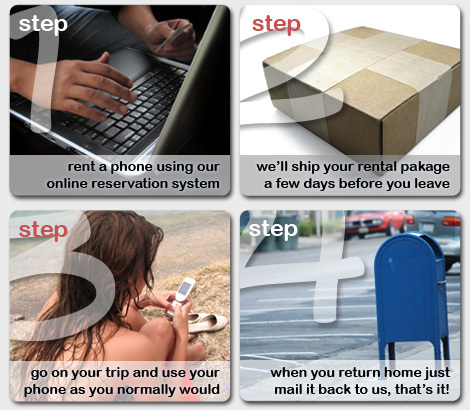 Have your phone delivered to where you're staying and enjoy low calling rates and a local number. I already have a cell phone, will it work overseas? Depending on the type of cell phone you own, you may be able to take advantage of prepaid global sim cards on your next trip overseas. Prepaid global sim cards provide a reliable global service with prices dramatically lower than AT&T, Verizon, Sprint and T-Mobile. And you can use your current phone! Simply fill out the form below and we'll explain the rest.